Are your children spending too much time chatting? Are employees chatting and getting off task in the office? 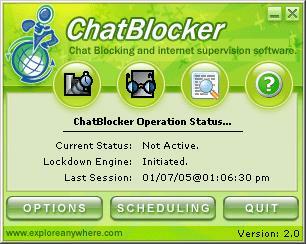 ChatBlocker is the powerful desktop parental control application for moderating and restricting chat conversations! With ChatBlocker, you can easily setup time slots in which you wish to allow chat conversations - and when you do not want to allow them. ChatBlocker uses an advanced, low level approach to blocking chat conversations to ensure that they do NOT take place. 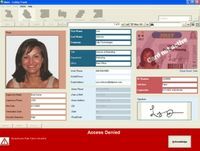 When coupled with ChatBlocker's powerful security features, it's powerful stealth mode feature, and remote log viewing capabilities (via e-mail) - it makes ChatBlocker must have for any parent, employer, or anyone else looking to moderate Internet chat's!